Faculty of Commerce B.Com.(Hons.) offers a one-year Comprehensive Banking and Insurance Programme, for the last 5 years, to make the student industry ready for the job market in the Banking and Insurance sector as soon as a student completes graduation. This course is designed in such a manner so as to create a balance between theoretical and practical aspects of modern Banking and Insurance services. It also prepares the student to appear in all the arenas of competitive exams (IBPS and IRDA). 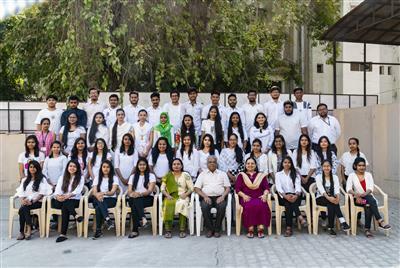 In the current year 2018-19, 42 students have completed the course successfully. Faculty of Commerce B.Com.(Hons.) successfully conducted Bridge Course to develop English Proficiency skills for the Semester 1 students. 60 students enrolled for the course and were given training of English Listening, Reading, Writing and Speaking skills. They also appeared for the BULATS examination at the end of the course. 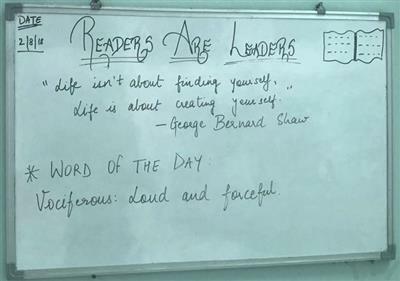 “READERS ARE LEADERS” presents a motivating thought and a new word to everyone on the campus through White Board placed outside of G1 Classroom. This Whiteboard communicates to the masses and spreads the knowledge. A well said thought churns the mind of every reader and a new word is added to the vocabulary of every passerby everyday. Students with full dedication and enthusiasm write a new thought and a new word on the board and other students eagerly await the new arrivals. This entire activity is coordinated by Prof. Rupa A. Pariyani. Faculty of Commerce B. Com. (Hons.) has organized training program for graduate and post graduate Girl Students in association with ICICI Direct for Mutual Fund training from 11th to 13th March 2018. Exam was conducted by NISM (National Institute of Security Management) on 16th March 2018. The workshop was conducted by Mr. Bhargav Dave who is a Capital Market Trainer empanelled with NISM. 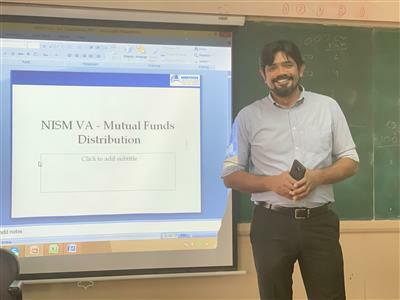 He provided precise understanding of Mutual funds with their real life advantages and disadvantages with detailed explanation of each scheme and its requirements to assess capacity to invest. He focused on the need for investment keeping factors such as Risk, need of liquidity, capital growth etc. in mind to procure tax benefitting schemes. 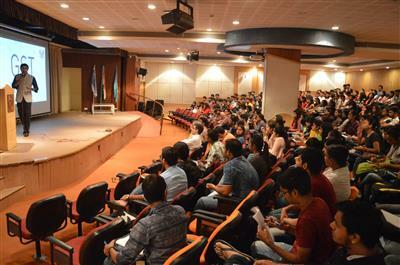 The students were made aware of importance of Systematic investment in this workshop. To inculcate research aptitude and skill among students, under Statistics Club, Faculty of Commerce B. Com.(Hons.) students were given various small research projects. Arhan Shah (Sem 6 B. Com.) and Pinal Bhagat (Sem 4 M. Com.) had prepared research papers on ‘Analysis of Selected Profitability Ratios of ONGC’ and ‘A Study on Petrol and Diesel Prices in India using Moving average Method and OLS Method’ respectively under the guidance of Dr. Devyani Chatterji. 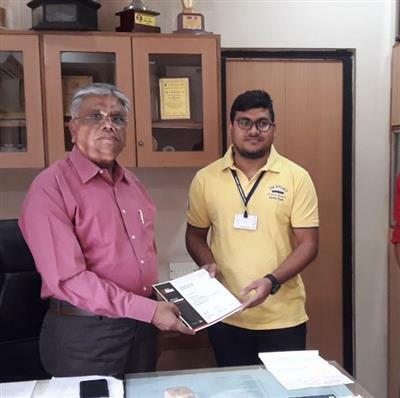 Arhan Shah’s research paper was selected for International Conference on Advances in Theory, Research and Practices in Management (GLSU-ATRPM 2019) organized by Faculty of Management, GLS University and was presented by him on 23rd February 2019, in the International Conference. To commemorate 150th birth anniversary of Mahatma Gandhi and to promote Gandhian values and ideals amongst the students, Forum for Gandhian Philosophy of Faculty of Commerce B. Com. (Hons.) organized the preliminary round of “Gandhian Quiz” on 17th January 2019 in which 60 students had participated. Students were provided with books titled “Gandhiji’s Autobiography” to prepare for the Quiz. From 60 students, 12 students were selected for the finals. 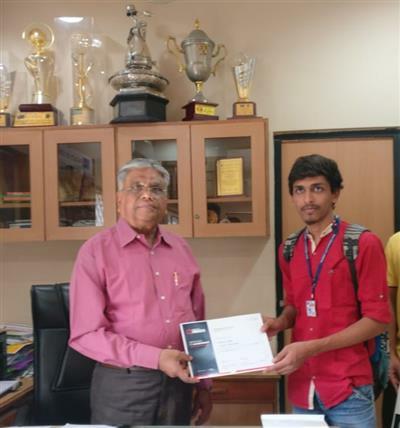 The finale was conducted on 13th February 2019 by the Quiz Master Dr. Alpesh Upadhyay, Associate Professor of Saraspur Arts and Science College, Ahmedabad. The event was coordinated by Dr. Devyani Chatterji and Prof. Anjali Trivedi. The Quiz Club of Faculty of Commerce B.Com.(Hons. 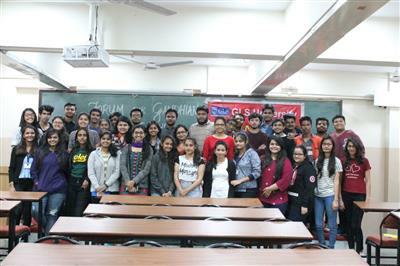 ), GLS University is designed as an innovative and interactive programme to facilitate a copious flow of knowledge and ideas among the students packaged in exciting rounds. 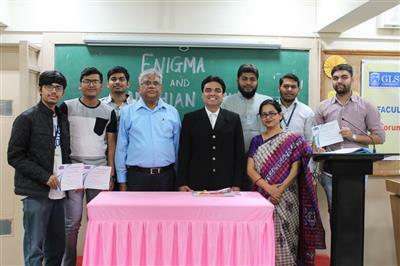 ENIGMA: The Quiz Competition 2018-19 organised a Preliminary Round on 11th September 2018 in which 39 students participated from them the first 15 students were selected for the Finale. Finale was held on 13th February 2019 which was conducted by the Quiz Master Dr. Alpesh Upadhyay who has rendered his services as a Quiz Master in many Youth Festivals in Inter-College Saptadhara Quizzes, Inter-District College Quizzes at BISAG etc. The whole event was coordinated by Dr. Devyani Chatterji. To enhance practical knowledge about financial markets and emerging technology of Block Chain in India, a seminar on Block Chain Technology and its future scope in Indian Commerce Sector was organized on 8th February, 2019. It was conducted by BSE regional office followed by individual Aptitude Test. 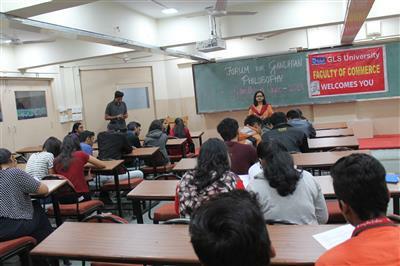 91 students participated in the seminar.It was coordinated by Dr.Krupa Bhatt and supported by Dr.Jaimin Patel. Faculty of Commerce B.Com (Hons.) organized a seminar on Digital Marketing and its future scope in Indian Commerce sector on 7th February 2019.It was organized to inculcate practical knowledge about new foundation course subject Digital Marketing to B.Com(Hon.) semester 4 students. It was conducted by Mr.Niral Modi from tops technologies pvt.ltd.330 students from semester 4 participated in the seminar. It was coordinated by Dr.Krupa Bhatt and supported by Dr.Jaimin Patel. To celebrate the birth anniversary of Swami Vivekananda and to pay tribute to this great sage and thinker, Swami Vivekananda Study Circle of our college organized an Inter-collegiate Swami Vivekananda Elocution Competition for undergraduate students of different colleges of Ahmedabad on 12th January, 2019. Dean Dr. Ashwin Purohit delivered the welcome address and explained the importance of Vivekananda's thought-provoking lectures, quotes and writings that have been a subject of study and a great source of motivation for the youth. Seventeen participants spoke on the topic “The bigger the struggle, the better the triumph will be.” The competition was judged by Dr. K.S. Purohit, a renowned Gastroenterologist, Dr. Chetan Bhatt, Principal, Government MCA College, Maninagar and Dr. H. D. Sikh, Principal, Saraspur Arts and Commerce college. The winner Raxit Suthar from C.U. Shah Science College was awarded trophy, certificate and cash prize. The 2nd and 3rd winners Jhanvi Patro from GLSBBA and Raj Virani from L.D. Arts college respectively were given cash prizes and certificates. Miss Kajal Shah from GLS Law College and Yashvant Kumar Shrimali from C U Shah Arts College were given consolation prizes. The competition was coordinated by Dr. Bhumika Ansodaria. On 20th December, 2018 Faculty of Commerce organized presentation on training sessions with regards to Financial Planning, Wealth Management, Capital Market module of NISM (National Institute of Securities Markets) for UG and PG girls students. The presentation was given by Mr. Vishal Gada, Director, Financial Planning Academy, Mumbai. The basic motive of such training module with relevance to Mutual Funds is to provide guidance and help them to be self dependent with knowledge of financial planning. Further sessions and examination will be conducted at the institute level. Faculty of Commerce B. Com. (Hons.) 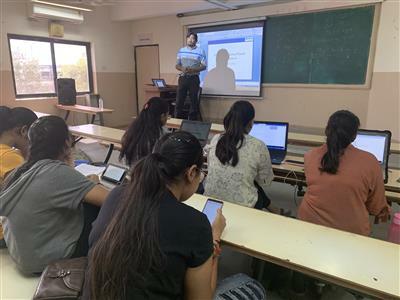 organised a two day Data Analysis Workshop on 11th and 12th of December 2018 with an objective to acquaint the students about data, its analysis, interpretation and its business prospects in the near future. Dr. Ashwin Purohit, Dean, Faculty of Commerce encouraged the students to attend such kind of workshops and said that in today’s world Data is increasing rapidly through thousands of users, businesses and industries as a whole. Visualising, modelling and interpretation are the major aspects of data analysis and students need to understand the intricacies of the methods of Data Analysis through various Statistical tools. 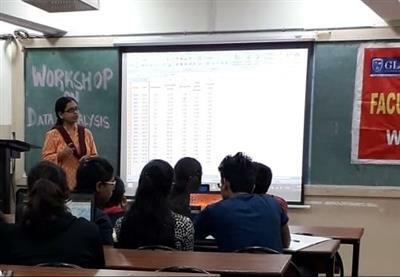 45 students enthusiastically participated in the Workshop in which they were taught to do trend analysis of the data using Moving Average Method in MS Excel, Correlation between the groups of data, Forecasting using Method of Least Squares and Regression Analysis. This workshop enhanced the research skills of students at under graduate level. The entire workshop was conducted by Dr. Devyani Chatterji. GLS University has designed an International Programme wherein participants will be immersed in the international environment for a Two week program based in Curtin University, Australia and University of Newcastle, Australia in the month of Jan/Feb 2019. 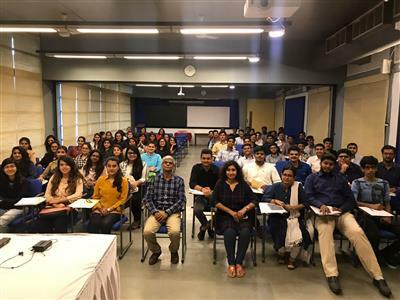 Dr. Dharmesh Shah Registrar, GLS University and Dr Shefali Dani Controller of Examination, GLS University delivered a very encouraging talk at Faculty of Commerce on 5th December, 2018 to enlighten the students regarding the International Academic exposure and benefits of participating in the International Immersion programme. Participating in the International Immersion Programme will provide students with international experience and should broaden the perspective on the world and professional networks. These immersion programmes will also include industrial visits, social services as well as several sight-seeing trips and cultural excursions. Faculty of Commerce B. Com. (Hons.) 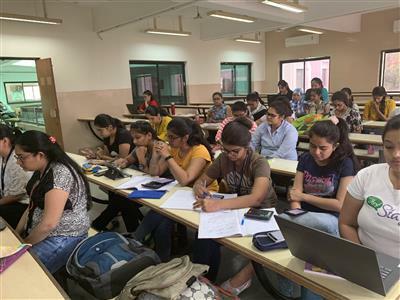 organised a National Level Quiz Competition – Inquisitive Minds on 30th July, 2018 in which 90 students had participated. The Quiz was a mixed bag with questions on General Knowledge, Reasoning, Mathematical abilities and Communication Skills. On this occasion, Dean Dr. Ashwin Purohit opined “The objective of organising such competitions is to facilitate a copious flow of knowledge and ideas among the students while ensuring that the students learn through all possible ways- not just through books and classroom teaching. Such activities help the students to sharpen their intellect and hone their skills.”6 students in a team of 2 were selected for the city level which was held on 1st November 2018. Teams selected for the city level were Rishabh Jain & Tirthesh Bohra; Pratik Periwal & Arhum Sancheti; and Saniya Memon & Aliasgar Rahi. Rishabh Jain and Tirthesh Bohra stood second and were selected for the finals which was held in Mumbai on 4th November 2018 and secured the fourth position. They were awarded with a cash price of Rs. 2000. This event was coordinated by Dr. Devyani Chatterji. Faculty of Commerce, GLS University organised a one day National Seminar on “Financial Planning for a Better Tomorrow” on 20th October, 2018 wherein 200 academicians and professionals participated. 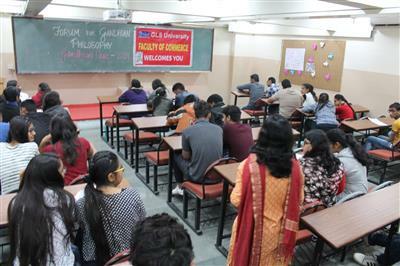 Dr.Ashwin Purohit, Dean, in his welcome speech, gave a brief introduction about GLS and GLS University. Explaining the significance of this seminar, he mentioned that as a part of the institute’s mission to march towards academic excellence, Faculty of Commerce has been organising such seminars. The Chief Guest and Keynote Speaker of the seminar was Shri Mukesh Patel, an International Taxation expert, who gave 5 points of Investment Advice so as to sustain and have stable earnings from the market. Mukeshbhai suggested that ‘Savings is a good habit and with planning, investing and tracking it, we can maximize wealth to make a better tomorrow.’ Experts from Mumbai were invited for the panel discussion whereby Mr.Sandip Raichura, an experienced and qualified economist guided the delegates on how small investments can be multiplied over a long period so as to have huge growth in investments, and Mr. Deepak Chellani, an expert International investment advisor, explained the diversification of investment in order to gain maximum benefits from the market. Another keynote speaker was Mr.Vikram Kasat, a professional financial analyst talked about various options of investments and suggested tips for investment in different companies for short term and long term period. The main motive of the seminar was to educate and help individuals on how to manage and grow their wealth through proper financial planning. Expert guidance was imparted on few essential topics like ‘Investing for income and potential growth in a periods of low interest’, ‘Preventing inflation from eroding your savings’, ‘Safeguarding your money’ & ‘Protecting family’s finances through Tax Planning’. The delegates gained great knowledge and a better understanding of key personal finance principles, including budgeting, savings, investing etc. The seminar was co-ordinated by Dr.M.E.Jokhi. 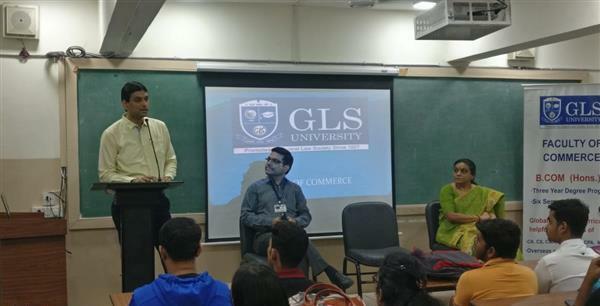 Faculty of Commerce, GLS University organised an Interaction Session with an upcoming teenage writer of the book ‘Shadows of Northlands’ - Vishwesh Desai on 12th October, 2018, Saturday. He discussed about his journey as a writer, his reading habits and how he got his first book published at the age of 14.The session was quite interactive as the students as well as the faculty members indulged in lot of discussion and a question answer session with Vishwesh Desai. At the end, the students felt motivated to develop reading and writing habits and to pursue them seriously. The event was co-ordinated by Dr. Gitanjali Rampal. GLS University has designed an International Programme wherein participants will be immersed in the international environment at world’s most developed nation’s i.e. USA and Canada. It is a three week program based in California Baptist University, USA or Georgian College Canada in the month of May/June 2019.Dr.Dharmesh Shah Registrar, GLS University delivered a very encouraging talk at Faculty of Commerce on 11th October, 2018 to enlighten the students regarding the International Academic exposure and benefits of participating in the International Immersion programme. The program consists of International Academic exposure as well as several sight-seeing trips and cultural excursions. Participating in the International Immersion Programme will provide students with international experience and should broaden the perspective on the world and professional networks. These immersion programmes will also include industrial visits, social services as well as several sight-seeing trips and cultural excursions. 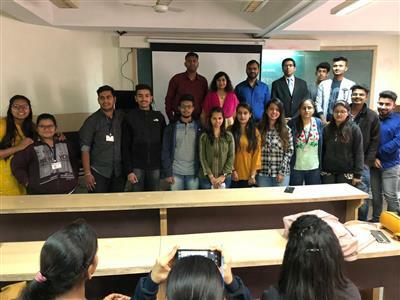 Under the auspices of English and Reading Club, Faculty of Commerce organized “Manthan: A Thought Provoking Mission”, an Inter – class Elocution competition with an aim to remove stage fear and improve oratory skills of the students. It is an event which is “For The Students, Of The Students, By The Students” .The Primary level competition was conducted on 25st of July 2018 in their respective classes wherein 135 students participated enthusiastically. 50 Winners of Primary Round participated in the Intermediate Round on 13th August 2018. Finale of Manthan was held on 12th September 2018. Dr.Mona Kelshikar, Principal H.L. 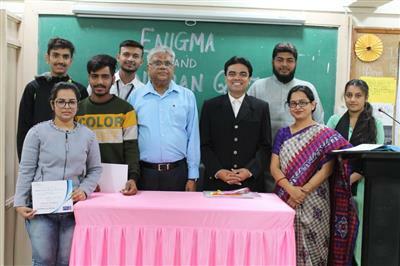 College of Commerce and Dr.Hiten Parikh, Principal, R.J.Tibrewal College of Commerce judged the Finale of an Inter-class Elocution Competition. The Event was coordinated by Prof. Rupa Pariyani and Dr. Gitanjali Rampal. The winners of Intermediate and Finale rounds were awarded with certificates. The winners of the Finale were also awarded with trophies. Faculty of Commerce, GLS University have knowledge sharing sessions on regular basis under the auspices of ‘Vichar Vartul’ which has been conceived by Dean Dr. Ashwin Purohit for the faculty members and staff. In one of these sessions, Shri Vadibhai Patel, Dean, Student Welfare, GLS University, delivered a lecture on ‘World Peace’ on 6 August 2018. In his engrossing address, Shri Vadibhai started how on this day in 1945, at 8:16 a.m. Japanese time, an American B-29 bomber, the Enola Gay, drops the world's first atom bomb, over the city of Hiroshima. The city has not only lost thousands of lives but is still suffering from its after effects as mentioned in a letter by the fourth generation victim of the bombings. He traversed through world politics and explained how the month of August has been quite revolutionary for many countries of the world. In India, the Quit India Movement, or the India August Movement, was a movement launched at the Bombay session of the All-India Congress Committee by Mahatma Gandhi on 8 August 1942, during World War II, demanding an end to British Rule of India. He put forward the history of British Rule in India right from the formation of East India Company to Independence struggle and finally formation of Indian Government. Throughout the session, the continuous undercurrent of the discussion was whether ‘War for Peace’ or ‘War or Peace’ as today more than ever the world strives for ‘World Peace’ amidst terrorism, political power struggle and nuclear weapon states. He ended on a very poignant note that if the third world war happens, the fourth would be with stones and bricks. Faculty of Commerce organized in house event named as “ROCK-O-NOMICS” on 31st August 2018. 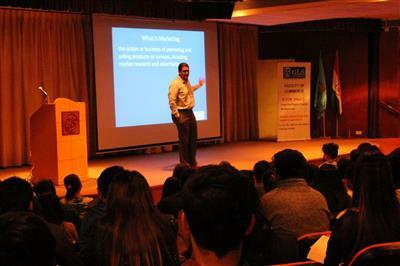 This event was conducted under the Economics Club. It was a one day event based on interesting economic games. It was consisting of three levels such as ECO FREAKO (Finding basic economic terms in the given creative puzzle), BLIND ALLEY (collecting money through given and maximize your budget) and ECOTIONARY (Make your team identify the term through your strategy). The main objective behind this event is to cultivate interest among commerce students for economics subject. The Economics Club is brainchild of Dean Dr. Ashwin Purohit Sir. 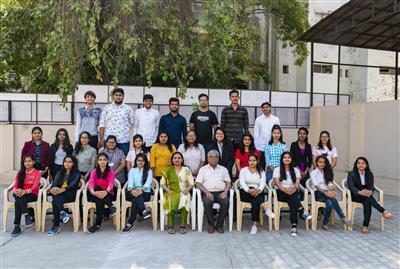 Under his guidance, ROCK-O-NOMICS 2018 was organized by Prof. Anjali Trivedi with the help of college students. Faculty of commerce organized a ‘Study Enhancement Programme’ – One day workshop at Ahmedabad Management Association on 23rd July,2018 in order to provide valuable knowledge inputs on Essentials of lateral thinking , Branding and Building Image and out of box thinking . 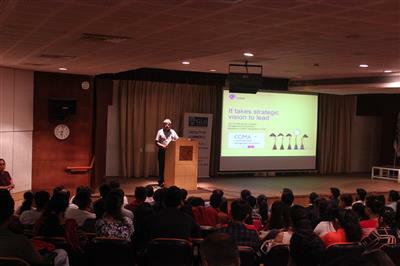 The renowned speaker and corporate trainer Mr. Vikas Chawda gave their insights on the above topics. 75 students participated in the workshop. The programme was coordinated by Dr. Krupa Bhatt and Dr.Devyani Chatterji. Faculty of Commerce organized a Guest Lecture by Mr. Anil Shrimali, Deputy General Manager (HR), The Kalupur Bank Ltd., for the students of Comprehensive Banking and Insurance Program on 20th July, 2018 at the Institute. He discussed in detail ‘Employable opportunities in Banking and Insurance Sector’ followed by questions and answers session. He discussed the nuances of appearing in the interview sessions as well. It was a knowledge gaining session for the students who aim to pursue Banking Career. The lecture was followed by distribution of certificates to the fourth batch of Comprehensive Banking and Insurance Program. As a part of successful completion of the course, 50 students were awarded certificates by Dean Dr. Ashwin Purohit and Mr. Anil Shrimali. With the objective of grooming students and acquainting them with the skills required to grow and sustain in the corporate world, Faculty of Commerce B.Com. (Hons.) organized Personality Development Workshop on 18th, 19th and 20th July 2018. Around 90 students attended the workshop. 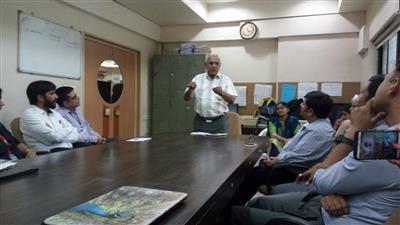 The workshop was inaugurated by Dr. Ashwin Purohit, Dean, Faculty of Commerce. In his inaugural speech, Dr. Purohit urged the participants to make use of the workshop to the maximum extent possible in order to enhance their communication skills and to groom their personality. On the first day, Ms. Smriti Joshi, a soft skill trainer and Image Consultant conducted sessions on Motivation and Communication Skills. The trainer explained five ways to stay self motivated and also explained in detail verbal, non-verbal, formal and informal communication. On the second day, Ms. Rini Bahal Purohit, a renowned Corporate trainer delivered sessions on Body Language, Grooming and Power Dressing. Students were given tips on personal grooming, voice projection, articulation, pace and fluency, body postures, eye contact, and gestures, presenting technical information clearly, concisely, and persuasively to develop an impressive personality and to master the art of expressing their thoughts and feelings in the most desired way. On the third day, Dr. Manroop Dhingra conducted sessions on Resume/CV writing and the Interview Skills. In the valedictory program held at the end, a few participants gave their feedback explaining how the workshop helped them improve their communication skills, Interview Skills, Etiquettes, Confidence and overall personality. In his valedictory address, Dean Dr. Ashwin Purohit congratulated the participants and the trainers for delivering sessions successfully and requested the participants to constantly improve upon their skills and competencies for their personal and professional growth. The program ended with a vote of thanks by Dr. Bhumika Ansodaria. The workshop was coordinated by Dr. Bhumika Ansodaria. 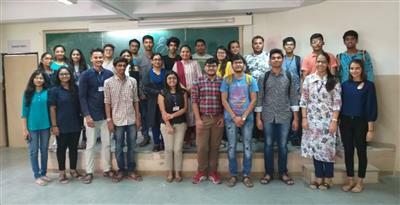 Faculty of Commerce, GLS University organised a seminar on Goods and Service Tax i.e., GST for students of Third Year B.Com and M.Com on 18th July, 2018.The seminar was conducted by CA Dhaval Gandhi. He is a certified trainer by National Academy of Customs and Indirect Taxes. He has authored a book on Indirect Tax Laws. He is a visiting faculty at well-known Universities like Nirma (Ahmedabad) and Christ (Bangalore). He has given many guest lectures at Ahmedabad and Rajkot branch of Institute of Chartered Accountants of India (ICAI). Dhaval Sir started off the seminar by giving an Introduction about Goods and Service Tax, its origin, and its implementation in the country. He talked about the types of GST and filing returns on GST. He informed the students about The Seamless Set of System being followed by India which has been a great advantage for GST and The National Anti-Profiteering Body being developed in the country. Faculty of Commerce, GLS UNIVERSITY organized a seminar with CIMA (Chartered Institute of Management Accounting), UK on 11th July, Wednesday in GLS AUDITORIUM. Parents and CIMA aspirants attended the seminar in huge number. Representative from CIMA-UK Mr. Satish Mistry, Associate Manager Markets India (West) conducted the seminar in the presence of Dean Dr.Ashwin Purohit, Faculty of Commerce, GLS University to give an insight about CGMA Qualification. Faculty of Commerce, GLS University, being the only educational Institute in the state of Gujarat has signed an MOU with CIMA-UK, the first Global Accountancy Body to pioneer a combination of computerized assessments. On the completion of this course students will be awarded CGMA- Chartered Global Management Accountant qualification.